For some, figuring out what you want to be when you grow up is a life-long challenge. For others, like Florida State University senior Connor Dacey, a spectacular event influences your life. 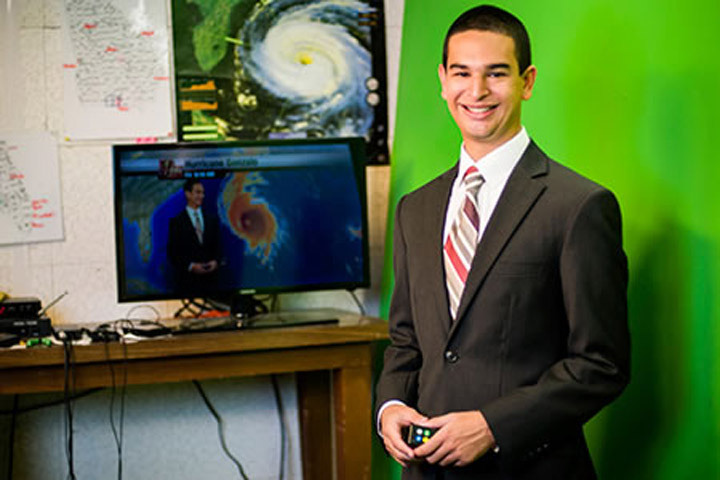 When Dacey was an 8-year-old playing outside, he witnessed a tornado form, then quickly dissipate just a few miles away from his home in Rockledge, Fla.
As an incoming freshman, Dacey was awarded the American Meteorological Society’s Freshman Undergraduate Scholarship. His academic achievements also include being a member of Phi Beta Kappa and Phi Kappa Phi honor societies, as well Chi Epsilon Pi, the national meteorology honor society. “During his years at FSU, Connor has built a wide assortment of skills through involvement in various activities,” said Jon Ahlquist, associate professor in the Department of Earth, Ocean and Atmospheric Science, who has helped Dacey tremendously throughout his college years. During the 2012-2013 academic year, Dacey was the science and outreach chair for the local chapter of the American Meteorological Society/National Weather Association on campus. In this position, he was responsible for coordinating outreach events with local schools and businesses, as well as with organizations from around the country. All of these efforts helped the local chapter be named the 2013 National Chapter of the Year. Dacey also prides himself on being an Honors delegate, a representative that introduces prospective students to the Honors Program and its amenities. Now, he is serving as the programming chair on the executive board and coordinating the Spring Preview events associated with the Honors Program. He hopes that his involvement has helped shape the future of FSU’s Honors students. “In being an Honor’s delegate, I have been given the chance to meet and talk to bright, incoming minds that will hopefully represent the university in competitions,” Dacey said. Representing not only FSU, but also the state of Florida, Dacey was named a 2014 Truman Scholarship finalist. A living memorial for President Harry S. Truman, this highly competitive award supports students who want to pursue graduate school in a career of public service. In competition with seven other finalists from Florida, Dacey was able to bring more attention to the STEM community, specifically meteorology, in a competition typically dominated by social sciences. While Dacey has a lot to be proud of, becoming a 2013 National Oceanic and Atmospheric Administration (NOAA) Ernest F. Hollings Scholar is at the top of his accomplishments. This award has allowed Dacey to work with current NOAA meteorologists and atmospheric scientists on different research projects. Over the summer, Dacey went to Boulder, Colo., where he performed numerical weather prediction validation and verification. Dacey is currently waiting to be notified about his application for the Department of Defense SMART Scholarship, where he has advanced into one of the final rounds. He is also looking forward to responses on his applications for the American Meteorological Society Graduate Fellowship and National Science Foundation Fellowship. After graduation, Dacey plans on attending graduate school to obtain a master’s degree in meteorology or atmospheric and oceanic sciences. Following his master’s degree, Dacey wants to pursue a doctorate in intelligence, meteorology with an emphasis on weather and climate risk, or geography and security. He is also interested in being a certified consultant meteorologist and working for a U.S. intelligence agency or defense contractor. Produced by the offices of Information Technology Services, the Provost, Student Affairs, Undergraduate Studies and University Communications.